Have you ever had something rattling around in your head and just couldn’t wait to find a reason to make it? These nest cupcakes were like that for me. 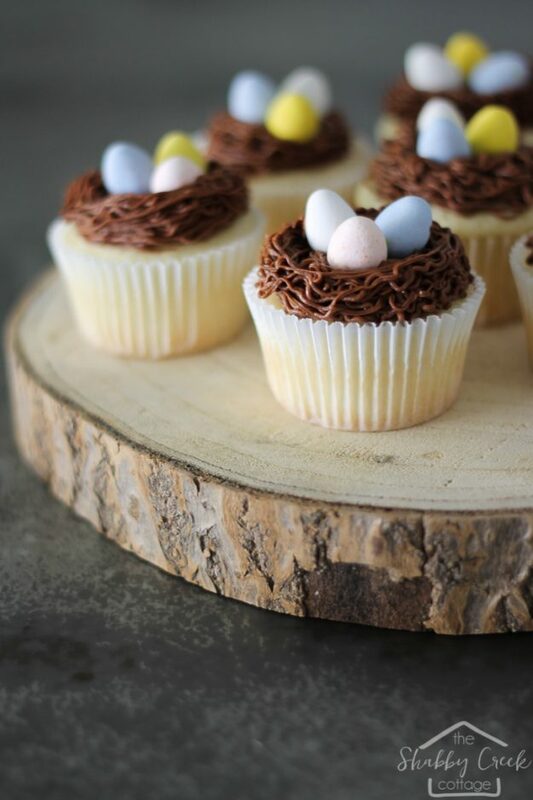 Although they’d be perfect for spring, I originally made these for my step-daughter’s baby shower and they were a huge hit. Besides that, after perfecting my regular cream cheese frosting, I knew that conquering chocolate frosting was next on my cooking to-do list. When you add up those two things, it meant that I had another great reason to create these cupcakes and share them with you. 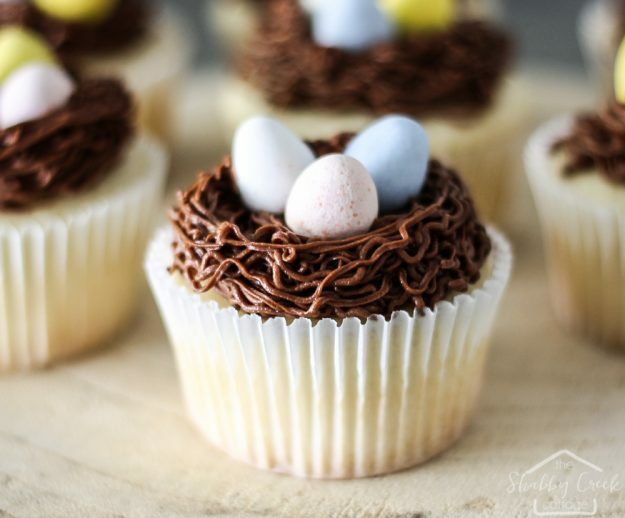 They are SO easy to make – and the frosting is absolutely delicious. 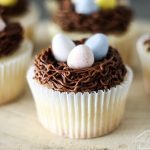 So even if you don’t make the nest cupcakes, be sure to try it if you’re a chocoholic in need of a good frosting fix. In the bowl of a stand mixer with the paddle attachment, whip together the cream cheese and butter for 2 minutes or until smooth and creamy. Make sure you sift the cocoa and confectioner’s sugar. Combine these and slowly add to the bowl of the mixer one third at a time and mix until it is combined with the butter and cream cheese before adding the next batch. Once the sugar is all added into the bowl, add in the vanilla and heavy cream, then mix on low until combined. Whip on high for 5-8 minutes until frosting is smooth and has lightened in color a bit due to the whipping adding a bit of air into the mix. It will be lighter and silky smooth. I used the hair piping tip (aka Wilton 233) and disposable bags to pipe the frosting.